Whenever I try to run Mari0, I get to the main menu, but when i start the game, it stops as it displays the lives, then gives an error. If this isn't enough, please tell me what else I need to post, and how to find it. Also, don't give me any "download Love 0.8.0" or "running it on your microwave?" crap. This is serious. Be serious about it. And thanks in advance. It's related to Nvidia OpenGL drivers. Though considering you're running Pentium 4, I won't take any guesses as of which GPU you're running. If you don't already have a nvidia control panel, press Win+R, enter dxdiag, take screenshot of display tab. Well, it says i have the latest Nvidia drivers, so i don't think it's that. But, uh, what the hell is a Win key? EDIT: Mmm... figured that out... sorry. All I really need to know is how to take a screenshot, and what to take it of. But I "have" a Nvidia Control Panel, which I can launch whenever. For taking screenshots, use PrtSc (it may also say SysRq) key. Afterwards, open up Paint (or some other image editing software) and paste it (Edit->Paste or Ctrl+V). Afterwards, save it as .jpg file and upload to an image hosting site, like http://imgur.com - then copy the BBCode (or just link) and post it. OK... but what do i take it of? 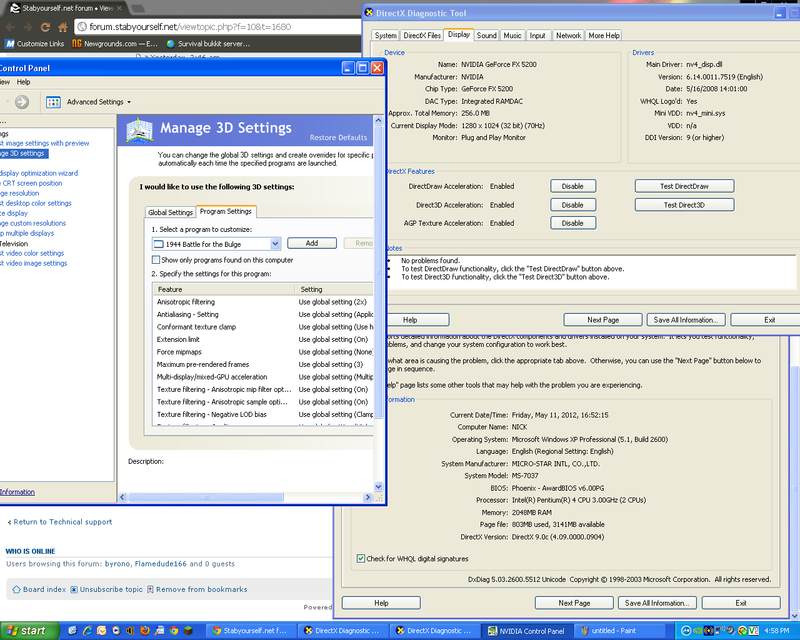 Nvidia control panel, and System and Display tabs of dxdiag. Since it supports OpenGL 1.5 it should theoretically work. Can you confirm you're running driver version 175.19? Downloaded the thing at the link. To no avail. The same problem occurs. Any other tricks up your sleeve? 1: Disabled Norton Antivirus, tried game. No change. 3: I didn't see what good running another of the games would do. 4: By Source, did u mean of Mari0 or Love? Also, after installation, i could not open the program (not a valid Win32 application). 3) Because it narrows down possible problems. 4) Download source for Mari0, and the .exe for löve and install it. You may need to restart before just doubleclicking the mari0 .love file works. 3) Ortho Robot and Not Tetris 2 both work fine with the Windows download. 4) I'm still not sure I understand what you want me to do. I can't open Love because it gives me an error saying that it's not a valid Win 32 application. I just noticed those are x64 builds. Derp. Well, I downloaded, restarted, and ran it. AND... Nothing. Although, must say, Mari0 seems to take maybe a second longer before the error appears, but I still don't get any gameplay. Now what? While unlikely (and completely against the shown error) to be the problem, you could try updating sound drivers. These should work for your motherboard. Or perhaps going into the Mari0 options under Misc and setting the volume level to zero. But if that doesn't work either, then you're out of luck. Though your PC specifications are very good, i think that you are using an outdated processor that isn't sufficient to run the game. You should try with the latest graphics drivers. Actually, it's been quite a while since I posted this topic, and I have gotten a completely new computer between now and then, which is fully capable of running the game, and many others. So, technically, this issue is resolved.